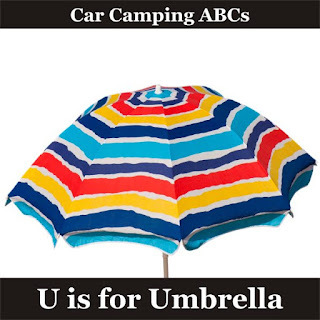 There’s no doubt about it – I’m an umbrella fan. For the most part, I don’t like hoods or hats and prefer to hold an umbrella instead. And I even bought Joel an umbrella hat to protect his camera when he's out taking pictures in the rain. 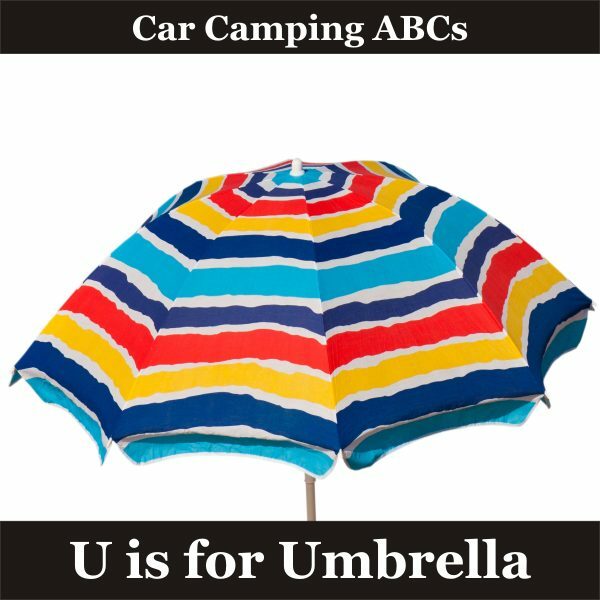 If you don’t already have an umbrella living in your car, be sure to pick one up before your next car-camping adventure. NOTE: Amazon link is affiliate. 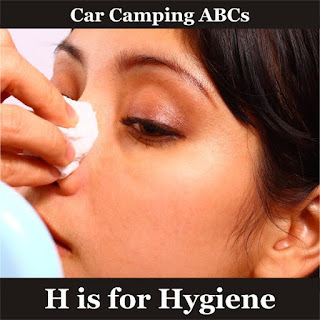 Proper hygiene is important to good health but how do you stay clean while car camping? Swimming – if regular swimming is included in your plans, you’ll be clean by default! 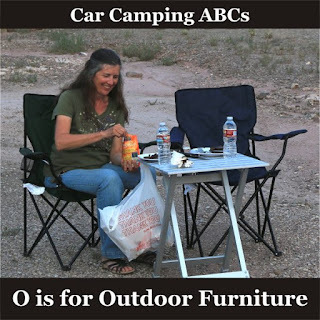 You can also clean up in a public restroom or pay for a shower at many campgrounds and truck stops – I just didn’t include those options as suggestions because it’s not what we do. I prefer baby wipes for routine cleanliness and try to plan a motel/hotel stay every 3-4 days. Joel’s trying to stretch out the time between paid lodging so is thinking of ways to heat water while we’re driving that we can use for showering when we stop each night. I can’t wait to see what he comes up with! NOTE: Above links are affiliate. 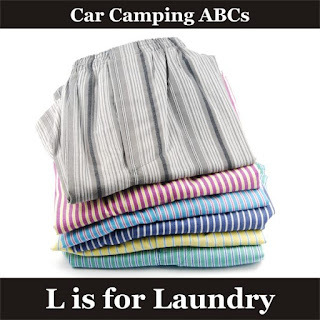 Coin-operated washers and dryers are available in most towns and RV parks, so you can probably wash as often as you need to – if you want to spend the time to do so, which I don’t. 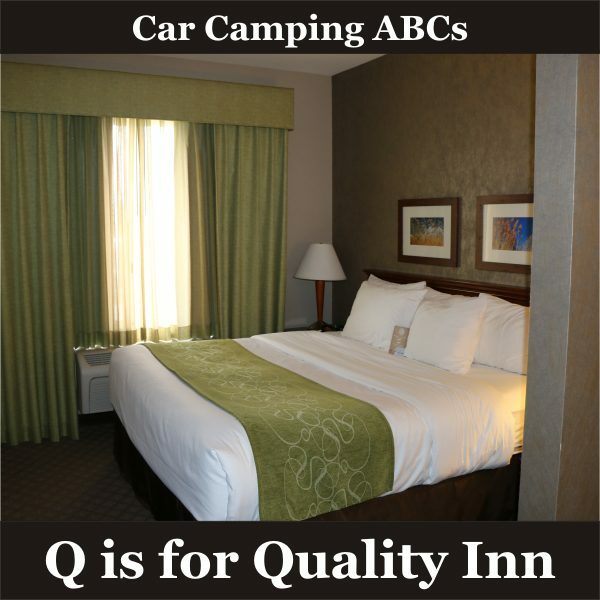 My preference is to periodically include a hotel with coin-operated guest laundry in my plans (see Q is for Quality Inn). You can bring soap/dryer sheets from home to save money. And if you’re on a super-tight budget, you can keep your clothes reasonably clean on the cheap. 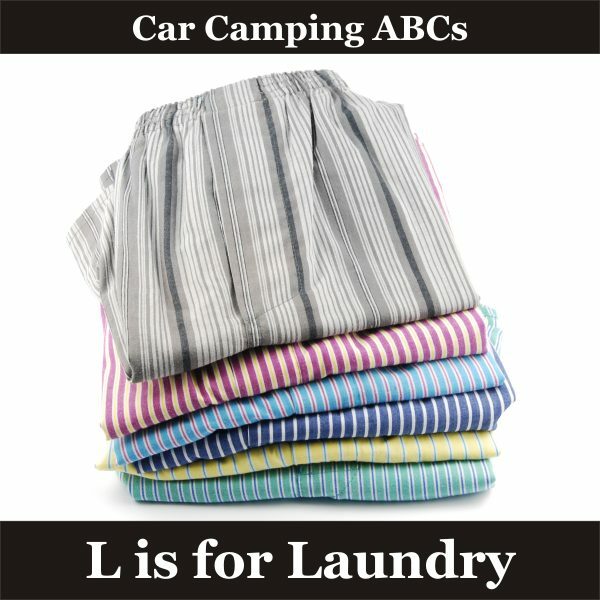 Years ago when camping remotely for weeks at a time with two small children, I washed our clothes by hand and then draped them over bushes around camp to dry. It takes a little time but is effective and free. Weather permitting, you can also swim in your clothes and then dry off – just be sure not to get them dirty again while still wet! 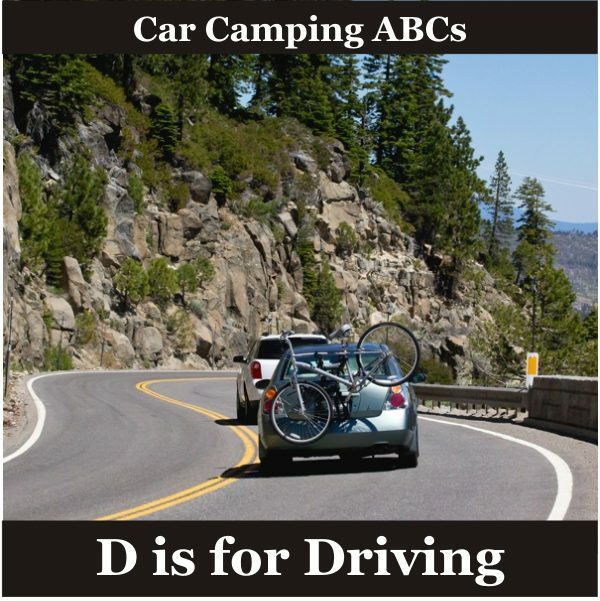 You can leave these items outside the car at night and then slide them (folded) under your deflated mattress while traveling. How easy is that? NOTE: Amazon affiliate links are to items similar to those we took on our trip. 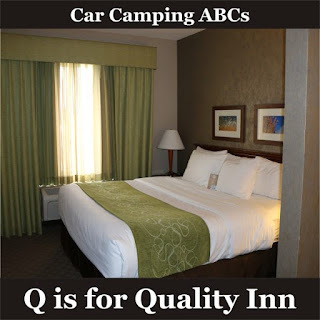 So what does Quality Inn have to do with car camping? Maybe nothing but if you find yourself in need of a room, my experience is you won’t go wrong with Quality Inn. During the 2-week Missouri leg of our 12,360-mile road trip, we paid for lodging five nights, four of which were at Quality/Comfort Inns. Not only was each one clean and comfortable, they all had guest laundry available and included a nice breakfast, as well! Nothing will ruin your adventure faster than wrecking your car, so no matter whose turn it is, yield. Be patient and pay attention to other drivers. And whether driving or on foot, also yield to wildlife, especially bears, moose and bison, all of which can do a lot of damage – to you and/or your stuff. 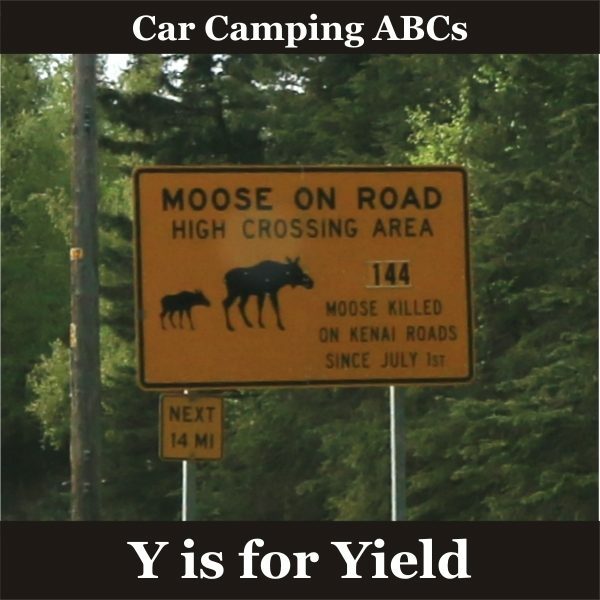 We saw several signs in Alaska with the number of moose killed on a given stretch of highway and I’m pretty sure the dead moose tally also reflects the number of totaled vehicles. When car camping, space is at a premium. After all, you’re sleeping each night in the same small area that houses your stuff by day. Even if you have storage of some sort attached to the top of your vehicle, there will be a lot of stuff with you in your car. 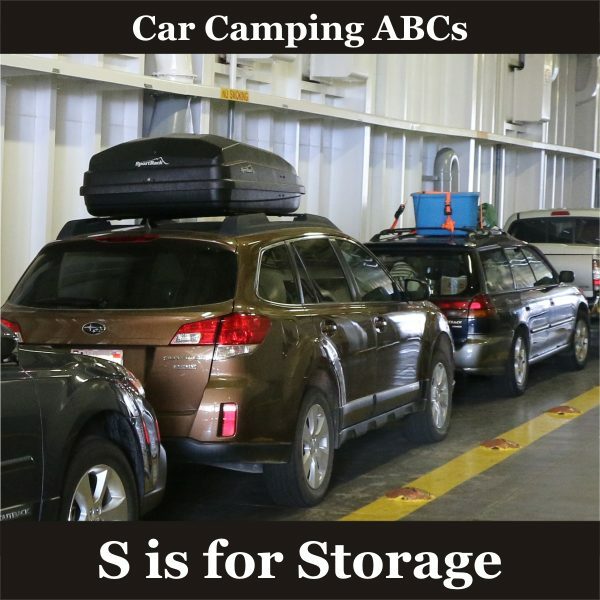 Ample storage makes car camping much more enjoyable so plan your storage well! NOTE: I added Amazon affiliate links to show storage options similar to the ones I chose but be sure to read customer reviews and shop around for the best price. I did most of the driving on our 12,360-mile road trip, which freed Joel up to take pictures. For the most part, this worked out well since I’m not much of a photographer but don’t mind driving except in cities or heavy traffic, neither of which was much of a problem in Alaska and Canada. The problem I did have in the far north, however, was driving too far and for too long. For those who haven’t experienced it firsthand, the long daylight hours in the far north during late May and early June can cause you to totally lose track of time, which in turn can lead to extremely long days behind the wheel. Many mornings we started out around 4-5 am and didn’t call it quits until 10-11 pm. After a few days like that, the lack of sleep starts taking a toll! My life is changed! If you’re a guy, just skip this. But if you’re a gal (and especially if you’ve reached your middle years), read on. 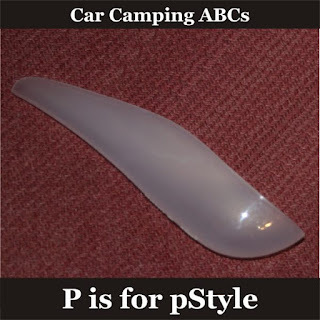 The pStyle is a nifty device that lets us ladies pee standing up and fully clothed, which makes car camping out in the boonies much more comfortable and convenient. The pStyle also comes in handy in places you might rather not sit, such as pit toilets and port-a-potties. Although there are many types of female urinary devices available, I chose the pStyle for its utter simplicity. Basically, it’s just a contoured plastic trough that fits against your body and directs the flow. It’s easy to use while clothed and can even eliminate the need for toilet paper (truly – it’s not perfect but pretty darn close!). 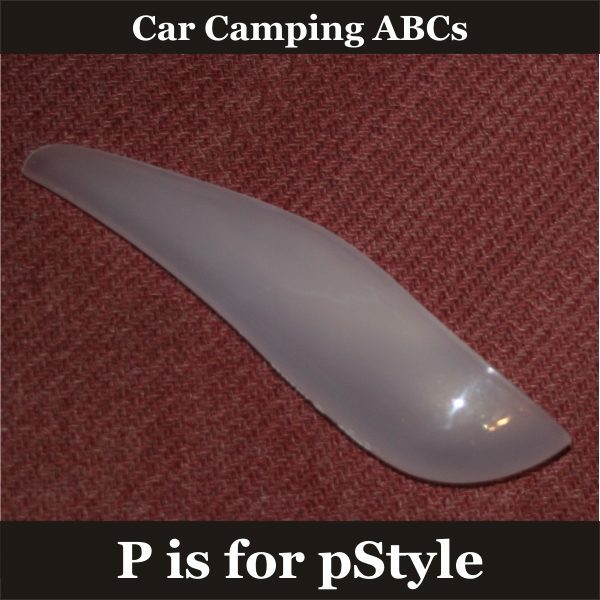 And the one-piece smooth plastic design makes cleaning your pStyle easy. What's not to love? Word of caution: Do not store your pStyle where it can be crushed. Although the plastic is sturdy, if you drop your heavily loaded backpack on the ground with the pStyle at the bottom, it can split. I found this out the hard way when I pulled mine out to use it the first time at a rather nasty roadside pit toilet halfway between Whitehorse and the Yukon/Alaska border. Fortunately it wasn’t split the full length and I was able to repair it with electrician’s tape, after which it worked fine the next six weeks of our trip. As soon as I got home, however, I ordered two more so that I’m prepared should I ever have another pStyle mishap. NOTE: Amazon links are affiliate.